Who Makes Good Affordable Banjos? When considering which banjo is the best for you to buy, not only look at banjo brands, but where and how they are made including the materials and craftsmanship that goes into the instrument. You will want to choose a banjo maker/supplier that has a reputation for good quality (the longer period of time the better) and top notch customer service. Just as important, think about what you need in a banjo: what fits your experience level and budget or for the person you are buying a banjo for. Do you need all the features I list here? Not necessarily. Look for getting the most you can, consider your own requirements, at the best value that you can afford. Our conclusion is that Jameson (best beginner model), Deering (made in the USA), Oscar Schmidt, and Gold Tone still make the best line of high quality yet affordable banjos (except for any other new entry level banjos for beginners that we find and can recommend) and that Amazon has a very good selection of these banjos and usually the lowest prices. Woods: The most favored woods are hard maples and mahogany for the head, hard maple for the neck. Closed, geared tuning pegs, made of high quality metals are the best. Closed gear pegs keep them clean and free turning. 5th string closed gear on the neck. Make sure this is geared also, or you will have trouble keeping it tuned, and with the correct tension. Non-geared often cause broken strings, and have to be adjusted frequently to keep it in tune. Metals should be of the best alloys and secured well so that there is no "humming" vibrations that interfere with the sound. Heads: 12" diameter heads are the standard. Bridges: A dual wood bridge is the best, with ebony on top (string side)being the best, maple below. Adjustable player controls: tail piece for sharpness, and an adjustable bridge for string clearance height (called "action"). Multi-layer rim construction. The rim head should have at least 3 layers for the best true banjo tone. Finish: The finish should be free of blemishes and look great. The cover frosted and long lasting. Sound: The tonal quality should have a good sharp classic banjo twang, whether picked or strummed (claw hammer style). The richer the tone, the better made the banjo and it’s parts. What Are The Best Banjos For A Beginner? Open Or Closed Backed Banjo? A new player or someone giving a banjo as a gift might be confused as to whether a closed backed banjo (the backing is called a "resonator") is better than an open backed banjo. Not usually, it depends on the brand as to whether they added any more bells and whistles or special finishes along with the resonator. Most banjo brands will have 2 types of the same banjo for sale, the open and closed versions. The closed back with a resonator just provides a louder sound, preferred by those who play to audiences where there is no amplification available. Bluegrass players tend to prefer the closed back banjo, as well. Open backed banjo players will often add a "pick up" to their banjo that is attached to an amplifier, to get a louder sound. Also, most, but not all, resonators can be removed as well. So, don't assume that a higher priced closed back banjo is of a higher quality than a cheaper open backed banjo. Look at the materials used, who makes it, customer reviews, and what kind of music you play. Check out our guide, read all the information, before you decide. How Do I Set Up and Tune A New Banjo? Vangoa 5 String Banjo Bundle-Great Buy! Note: Most stringed instruments ship with the bridge down, so there is no tension on the strings during transport (except for Deering who ship banjos ready to play). You might need to set the bridge up and tune it which is usually done anyway after you get your new instrument. It is not very difficult at all. 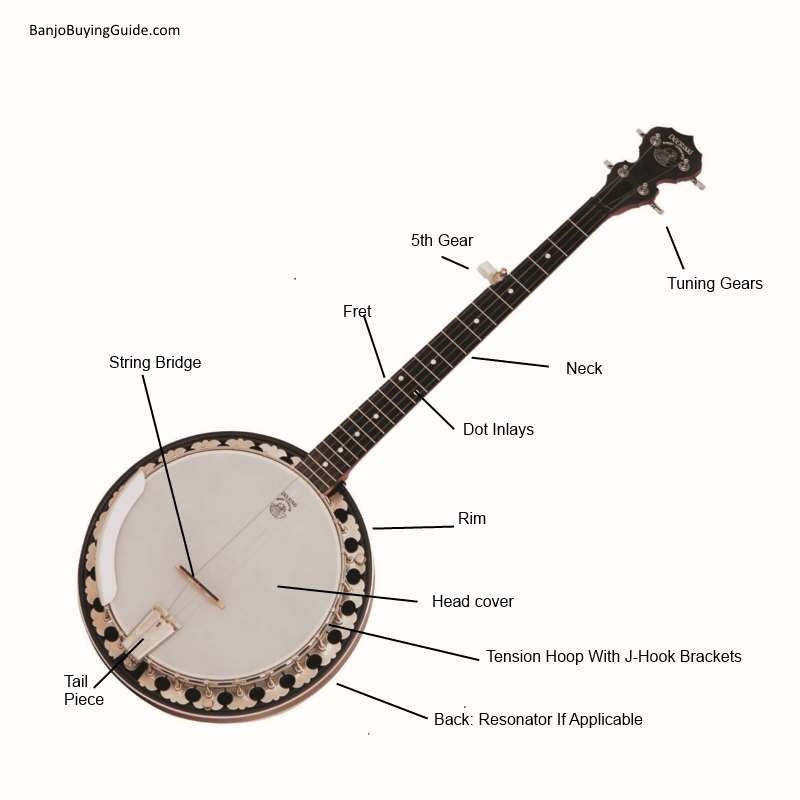 (Here are instructional videos to help you set and tune your new banjo). However, if you don't feel up to it, and there is an instrument shop available near you, you might take it in to see if you have set it up properly, making sure you are getting the best sound your instrument can produce. It usually doesn't cost very much at all, and new players can learn a lot by talking to the professionals at their music store. They also might be a good resource for you for finding groups of beginners who are learning together, or others at your level, that you can join. Playing with others at your level is a great way to learn more quickly and they can be a lot of fun! Banjobuyingguide.com is a participant in the Amazon Services LLC Associates Program, an affiliate advertising program designed to provide a means for sites to earn advertising fees by advertising and linking to Amazon.com.